I recently visited the island of Langkawi, Malaysia for five nights. We had a great time and really enjoyed a lot of what the island has to offer. 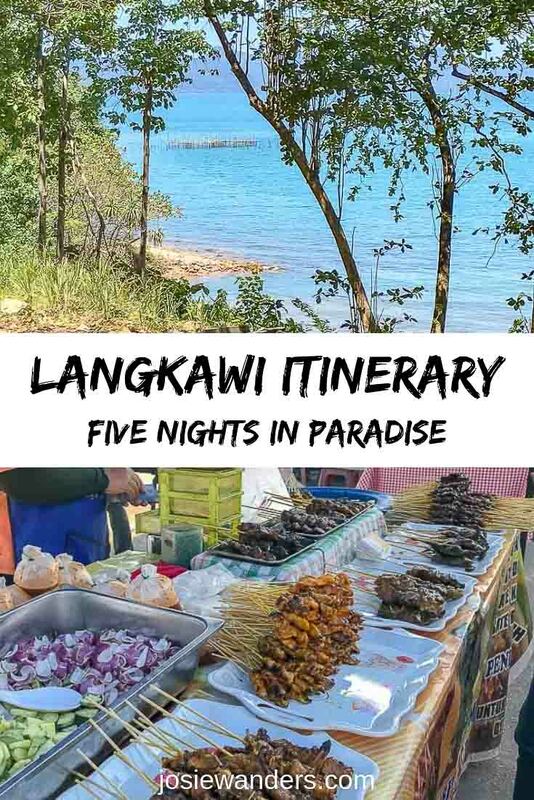 Since returning, I’ve had a think about the good and bad parts about what we did, have shuffled things around a little, and have come up with the perfect five nights in Langkawi itinerary. Langkawi is located off the north west coast on Peninsula Malaysia. 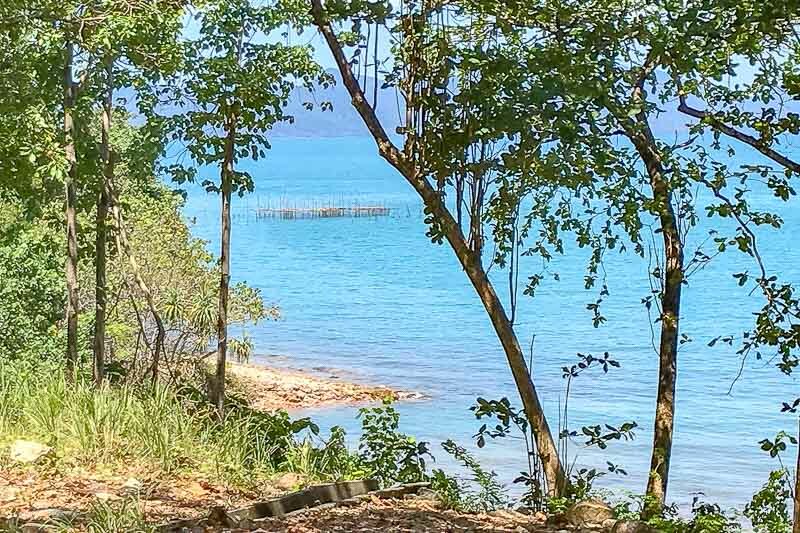 It is so close to the Thai border that it is easy to see the Thai island of Ko Tarutao when you are in the northern parts of the Langkawi Island (Pulau Langkawi). The Langkawi archipeligo is made up of 99 individual islands. It is in the state of Kedah and is often called the Jewel of Kedah. Mostly recognised for its stunning white tropical beaches, great weather and delicious Malaysian food, Langkawi has been a popular destination for sun-seekers for some time. There is more to the islands than beaches though. The importance of the nature reserves on the island has been recognised with the Kilim Geopark becoming UNESCO listed in 2007. Langkawi is the site of the Tour of Langkawi, Malaysia’s version of the Tour de France bicycle race, usually held in March of each year. The main town on Langkawi Island is Kuah, the business and government centre. The town of Pantai Cenang is the biggest tourist area, situated on the long, sandy, Cenang Beach. Langkawi is designated as a duty free island, so look out for the many duty free stores during your visit to pick up some bargains. The best time to visit Langkawi is between November and March which is the dry season. During this time you will likely have hot, sunny days with no rain, perfect for spending time on the beach or in the water. Black Sand Beach. Well, there are flecks of black sand there. 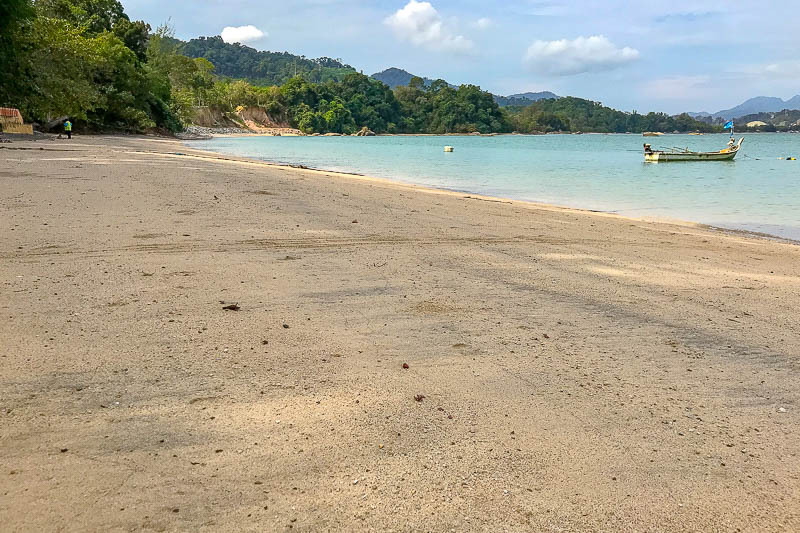 On your arrival day, check into your accommodation and then head straight to the beach to relax for the remainder of the day after your ferry or flight to Langkawi. It is likely there will be a beach close to where you are staying, particularly in the tourist areas of Pantai Cenang. At Pantai Cenang you will find long, white, sandy beaches lined with cafes and restaurants. There are lounges and umbrellas for hire on the beach, and all sorts of water sports on offer. 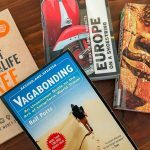 Use this time to recharge after your travel and to get your bearings. Now is also a good time to book your tours through the operators on the main shopping street adjacent to the beach if you haven’t already done so. We found the agents here to be all cash only, so make sure you have enough Malaysian ringgit if you would like to book through them. For dinner I suggest you consider the Night Market if it is nearby. The location changes each day of the week as it moves around the island. For just a few dollars you will get to try all sorts of delicious local foods. I recommend the satays, my family’s favourite whenever we are in Malaysia. Fried chicken seems to be a popular night market food that I have not seen elsewhere in Malaysia, with many stands dedicated to it. It does taste pretty good too. One of the Ayer Hangat Village hot springs on the right. The buildings at the left and back are private jacuzzi rooms. Essentially today you are going to do a lap around the island, visiting the attractions that interest you along the way. We started our lap from our accommodation near the airport, but of course you can start it from wherever you are staying. Telaga Tujuh (Seven Wells) Waterfalls – Lovely waterfalls located near the Langkawi Cable Car. Either visit today or leave until tomorrow when you visit the cable car. 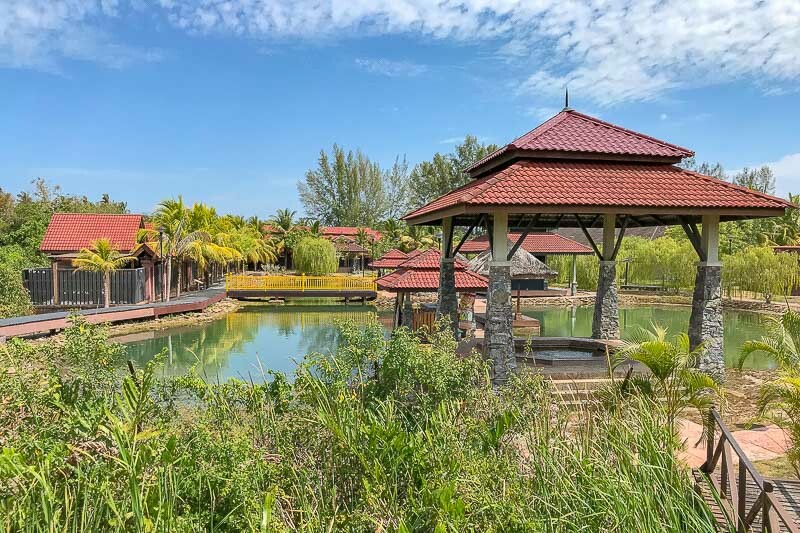 Langkawi Crocodile Adventureland – this wildlife park has over 400 crocodiles. Check the show times before you go to see the crocodiles being fed. You can also get your photo taken with a juvenile croc. Termurun Waterfall – only a short walk from the carpark, this waterfall has a pool at the bottom you can cool off in. Taman Lagenda – located in Kuah town, this park is filled with statues and information about the folklore of Langkawi. Makam Mahsuri – this tomb and museum pays homage to the legend of Mahsuri, who was sentenced to death because she was too beautiful. Her death cursed the island of Langkawi for seven generations. Learn about this legend and others at this museum. Langkawi Underwater World – With over 4000 different species divided into many different sections there is something here for everyone. Check the feeding times before visiting if you want to see them. Note: before visiting the waterfalls, I suggest checking with local sources if the time is right. During our visit in late February the waterfalls were quite underwhelming since it was the end of the dry season and there had been little rain to make them spectacular. 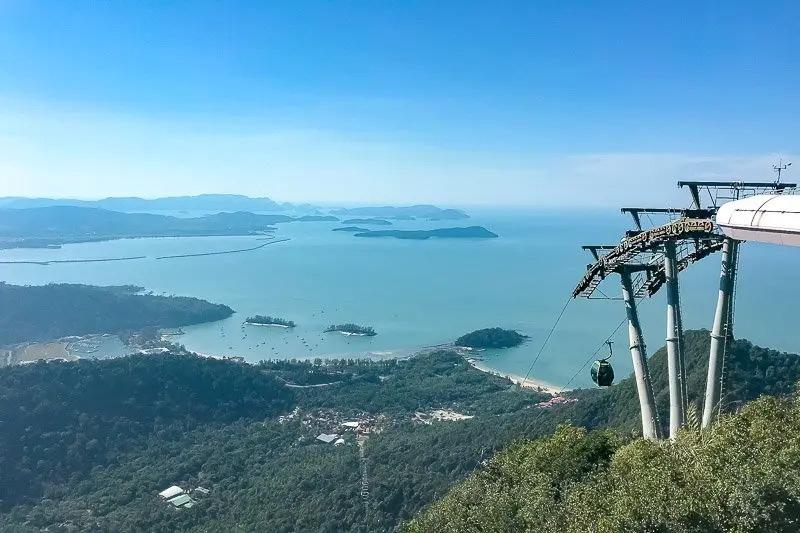 Today is the day to do one of the more popular things to do in Langkawi, and that is the Langkawi Cable Car and Sky Bridge. You will spend the whole morning in this area. First take the SkyCab to the top! When you enter, you will have to leave any water bottles you may have with you to the side for collection when you come down. Funnily, my husband had to hand over his bottle bought from the shop, but I was allowed to keep my refillable bottle. Pay at the top for the SkyBridge, and spend some time there too. Make sure you get a photo while on one of the glass sections of the bridge. When you come down, visit the extra attractions included on your ticket – SkyDome, SkyRex and the 3D Art. If you are short on time, skip the first two and just visit the 3D Art. Get your cameras out and get some great photos with these great artworks that make you look like you are right in the scene. Spend some time browsing through the Oriental Village. Perhaps pick up some souvenirs of your trip so far. Eat lunch at one of the food outlets. There are plenty to choose from, ranging from western-style restaurants to traditional Malay food in the food court. Tip: I suggest arriving as the Cable Car opens to beat the crowds. It will also mean you are finished in this area before the heat of the day really hits. Get dinner at one of the many restaurants along the beach or Jalan Pantai Cenang. Perhaps try the D’Grill Seafood restaurant on the beach, then head to the nearby Nest Rooftop BYOB Cafe for views of the sunset or a drink before calling it a day. Today it’s time to do two of the cruises you booked online or earlier in your stay. While there are dozens of different tours available, my suggestion is to do an island hopping tour. There are many different operators of the boat tour, but essentially they all offer the same thing. Pulau Dayang Bunting – the attraction on this island is the Pregnant Maiden Lake. So-called because looking at the hill surrounding the lake it looks just like there is a pregnant lady laying on her back. This freshwater lake has been set up with a floating pontoon, and offers swimming, kayaking and paddle boats. To get to the lake there is a 6MYR charge, and about a five minute walk over a slightly steep path. Beras Basah Island – this is your typical tropical island with white sand and turquoise water. 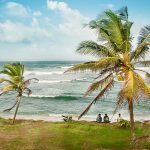 This is the perfect place for a swim, or you can participate in some water activities such as kayaking or riding on a banana boat. Better yet, just sit back, relax and people watch. The tour lasts until around 12pm when you will be delivered back to where you were picked up from. If you are back in the Pantai Cenang area for lunch, I suggest trying the Nasi Kandar Tomato restaurant, one of the most popular places to try the local Malaysian specialty of Nasi Kandar. Spend the afternoon relaxing, then get ready for your pickup for your dinner and sunset cruise. We were picked up at 4:15pm, with the cruise leaving at 5pm, so expect that sort of time frame. 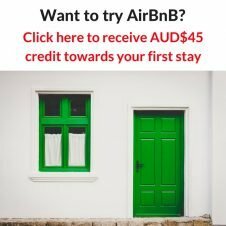 When you book and notify them of your accommodation you will be given the pickup time. Once on the boat you will spend three hours sailing around the beautiful islands, enjoying a drink or two as you relax. Dinner will be served, and then it will be time time to sit back and watch as the sun sinks into the ocean. 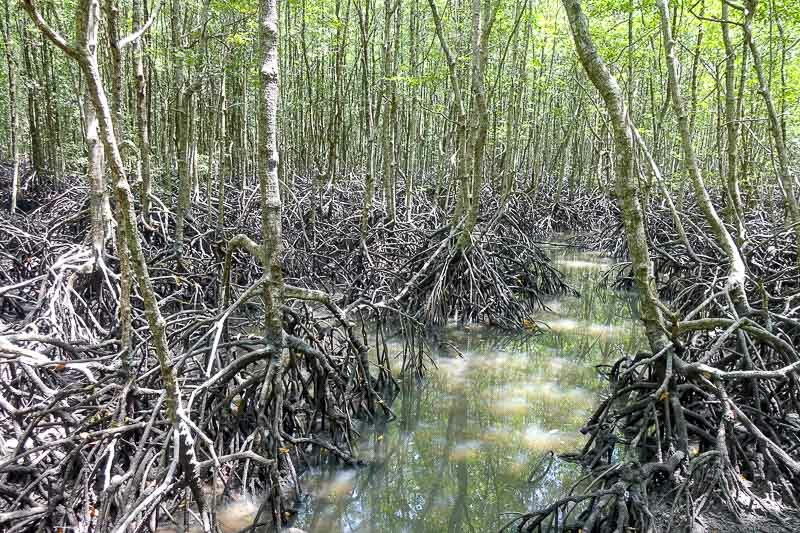 For your last day in Langkawi, enjoy a mangrove cruise through the Kilim Geo Park. Given UNESCO Heritage Listing in 2007, this area contains some unique flora and fauna, along with some ancient rock formations and fossils. There is a cave full of bats, and another that looks like a crocodile. 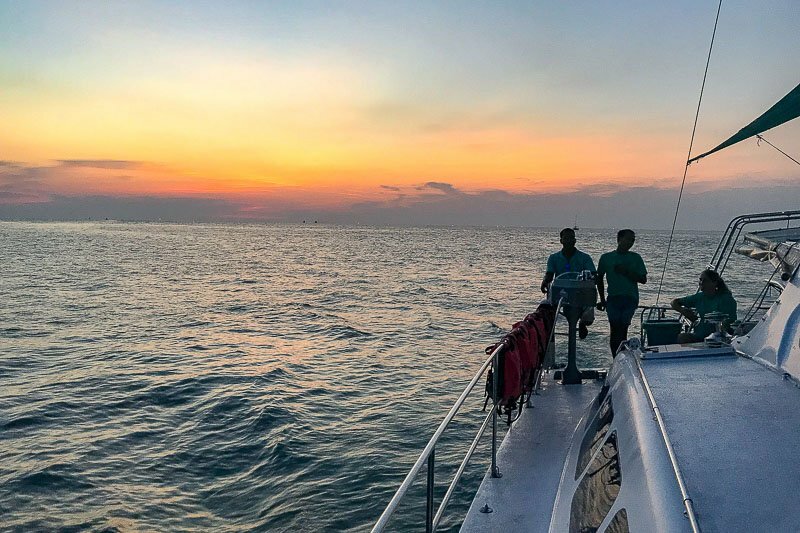 You will spend much of the day gliding up and down the waterways while taking part in fish feeding, eagle watching, visiting the bat cave and spotting some of the unique walking fish and colourful crabs. You will laugh at the endless antics of monkeys, even watching them swim and perhaps climb up onto the boat for a treat. You will stop at a floating fish farm, then enjoy lunch on the other half of the floating platform. The whole time you will be able to admire the beautiful water and scenery of the Kilim area. End the cruise with a visit to Tanjung Rhu beach for a swim before your car ride back. You will return back to your Langkawi accommodation at around 4pm. Take the time to squeeze in yet another visit to the beach, or just relax before dinner. For dinner head out again to eat all the food at the Night Markets, or if you are in Kuah, try Charlie’s Bar and Grill at the Royal Langkawi Yacht Club. In Pantai Cenang, try the Thirstday Bar and Restaurant, located right on the beach. Both these restaurants should give you great views to watch your last sunset while you eat. I just can’t get enough of the colour of the water. Unfortunately your Langkawi holiday is all but over! Depending on the time of your flight, you might just have time to fit in a few more things in the morning. You could just relax on the beach again, or if your hotel has a pool, take advantage of that. You could visit somewhere you did not get to go to from the list on Day Two. 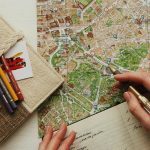 If your flight is later in the day, you could perhaps fit in another tour – consider one from the alternative list on Day Four. Or perhaps today is the day to do your duty free shopping, as you head to the airport or ferry terminal! 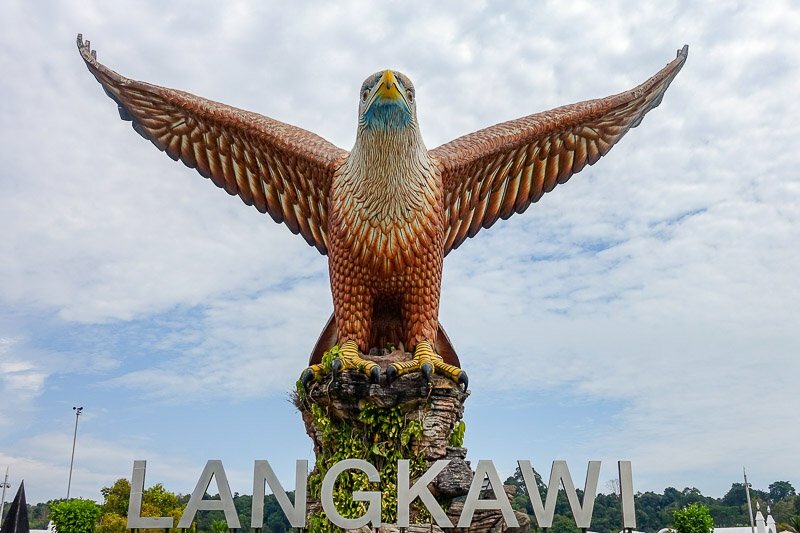 By Plane – you will arrive into Langkawi Airport. 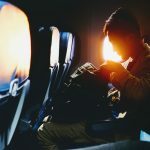 There are flights to here from many other countries around Asia, so you don’t have to fly into Kuala Lumpur first then fly from Kuala Lumpur to Langkawi. We flew from Singapore to Langkawi. By Ferry – commonly people will arrive on the Penang to Langkawi ferry. Alternatively there are ferries from Koh Lipe and Satun in Thailand, and Kuala Perlis and Kuala Kedah on the mainland. You have a few ways to get from the airport/ferry terminal to your hotel. If you are visiting Langkawi and really want the freedom to travel around the island at will, I strongly suggest you hire a car. The attractions are spread all over the island and there is very little public transport between them. With out your own car, you will have to rely on taxis or private drivers. Another alternative is to hire a scooter. Hiring cars and scooters are easy with many places in Pantai Cenang offering day hire. If you want to hire in advance, I use and recommend RentalCars.com for car hire all over the world. The website looks at cars available from most of the big companies and then lets you compare them on features and price. We used them again for this trip and were very happy. If you are looking for where to stay in Langkawi, in my opinion the best area is around Pantai Cenang/Pantai Tengah. It’s central to most of the attractions on the island, and has all the requirements for a good stay. 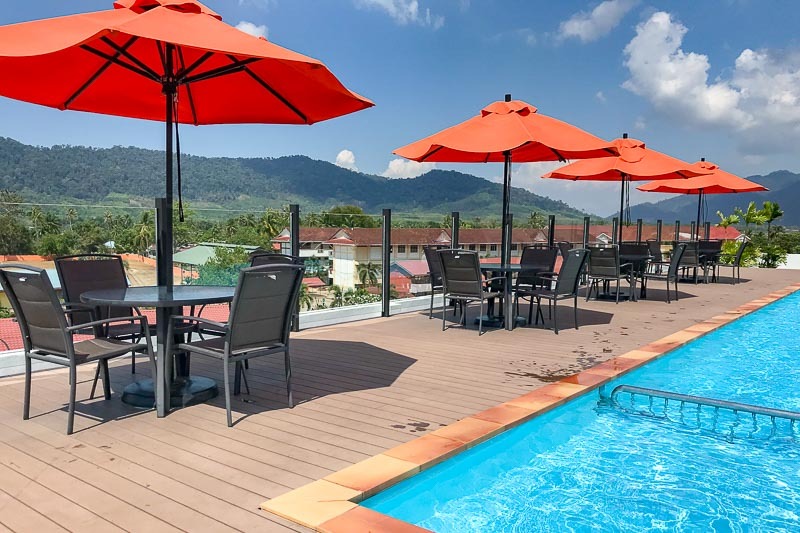 There is accommodation for all budgets, from hostels and homestays to luxury resorts, although it must be said, most of the big, luxury, Langkawi resorts are located in their own remote locations around the island. Now that I have said that, I am going to contradict myself and tell you about where we stayed – The Smith House. 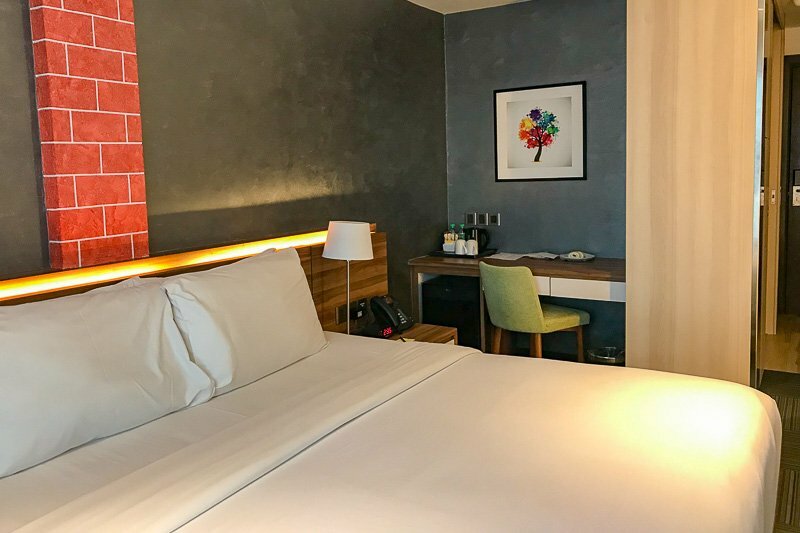 Located just minutes from the airport, I highly recommend this fantastic four star hotel – if you have a rental car. It’s relatively new, with lovely rooms, a rooftop pool with views to the mountains, a library, a bar and a restaurant on site. It was also exceptionally well priced with a delicious breakfast included. The only negative thing is the location, but if you do not need to be at a beach resort, then it will be fine. I would absolutely stay here again. Now if it is high end you are after, you can’t go past The Andaman, a Luxury Collection Resort. Located on Datai Beach in the northern part of the island, this exclusive resort is the height of luxury. 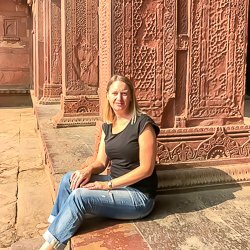 I’d love to tell you a little more about it, but we were not allowed to even pass the security guard to enter the grounds to have a look around – and yes, we did ask! I think this would be a great location for a Langkawi honeymoon! For a budget hotel in a great location, especially if you have a family, choose Malibest Resort. It is located right on the seafront in the middle of Pantai Cenang so it you want to be in the middle of everything, this is a great option. It is also relatively eay on the wallet, but still has good sized, clean rooms and it’s own pool nestled against the sand. All sorts of satays at the Night Markets! Our favourites are always the chicken! 3 Amigos – now to contradict myself again, because we did eat lunch at this one. I had read that it had good Mexican food, and I found it to be okay, but not amazing. Now a disclaimer here, I am from Australia, and we are not known for having great Mexican food, so perhaps this was good, it just wasn’t to my taste. Restoran Siti Fatimah – a local restaurant that will serve you up a whole place of food at lunchtime for only a few dollars. Great for if you are travelling further afield as it is located between Pantai Cenang and Kuah. Brasserie Restaurant and Bar – another one located right on the beach at Pantai Cenang for watching the sunset as you eat. I highly recommend that you eat at the Night Markets. We ate there nearly every night and the food was delicious. We would walk through and pick up whatever we wanted to try and eat it there and then. Each night we spent between 20 and 35 ringgit ($7-$12AUD/$5-$9USD) to feed both of us. This included a large drink to share too. I think that’s just about all you need for a fantastic Langkawi holiday! I hope you enjoy it as much as we did. Awesome! The timing on this is great as we just hit the purchase button on flights to Lankawi next fall. Very useful info! Almost went to Langkawi this winter. Will have to try for next year. Looks lovely. Thanks Phoebe. I hope you get to Langkawi soon. I’ve been to Langkawi. Unfortunately, I didn’t have time to see the mangroves, the night market, or a sunset cruise. I wish I had stayed longer. Oh, I’m sad you missed the night markets. I loved visiting them. 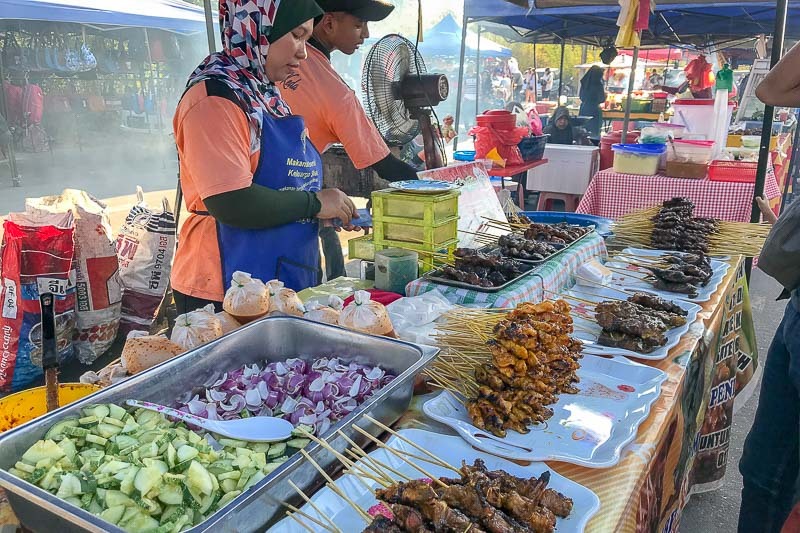 All the food…..
You must have been super busy experiencing all of these great opportunities in Langkawi! I’ve never heard of this place, but I would love to visit now that I’ve read your post. I thought it was fascinating to read about Makam Mahsuri and that someone could be sentenced to death for being too beautiful. It’s a very interesting situation I wouldn’t expect to happen. Thanks Brooke. Langkawi has a lot to offer, so yes, it’s possible to be very busy for a few days.